Hi, Lois here with another card for Easter. As a kid, I'm sure we all loved to color Easter eggs. I know I did. Using one of the new Easter/spring dies from CottageCutz, I made a card reminiscent of that fun experience. 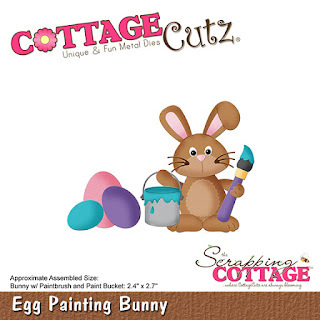 The CottageCutz die I used on my card is Egg Painting Bunny. I wanted to make my egg-painting bunny the star of the show, so I made a relatively monochromatic background for him, using various purple papers. 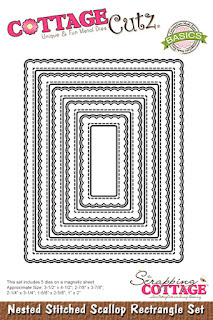 To start my card, I die-cut the pieces from white cardstock. Leaving the pieces on my sticky foam mat, I colored them using my favorite coloring medium -- my Copic markers -- using the packaging as a guide. After I colored the pieces, I constructed the bunny and his paint can. Purple card base - 8 1/2" x 5 1/2"
Pale violet patterned paper - 4" x 5 1/4"
Constructing my card was simple. I added some small foam pop dots to the back of the bunny and the eggs and adhered them to my card. I then stamped the sentiment, and I was finished. Be sure to check out the CottageCutz store because these Easter/spring dies (as well as some cute stitched dies) are currently 25% off. Awesome job coloring the bunny!! Super cute! Love that bunny! This is just wonderful. The colors are lovely! Super cute card! The bunny is so adorable and I love the colors of your card! So cute. I love how you colored the bunny. And the background colors are beautiful! Hi Lois the Anonymous comment is from me!! I don't know why it came out anonymous!! I love your easter card. It's perfect.